Over the past half-century, Naga communities often living in remote hill-top settlements, have faced a deluge of modernising forces, and today, an educated younger generation now participates in the digital domain. This paper examines the ways in which local cultural representations are linked to forms of agency in the midst of transition. For instance, a central focus of Naga art has been prowess in warfare, as courage brings with it certain status in the community. This has been linked with important customs such as choosing a suitable marriage partner. Widespread Christian conversion, however, has contributed to the removal of traditional effigies commemorating heroic ancestors. Moreover, modern schools have replaced many of the traditional sites - such as the morung or male bachelor's dormitory - for artistic development. As traditional artistic practices decline, collectors of Naga art have displayed them in galleries around the world, in many ways reifying old stereotypes. With growing tourism, the production of handicrafts that draw on traditional art is now a source of income for local artists, and cultural performances such as are found in the year-end Hornbill Festival are new sites for performing traditional uniqueness. As young people are more exposed to mass media entertainment, however, animation proves a viable alternative for young artists not at home in traditional art mediums. This article looks at the ways in which animation is used by young artists in exploring identity and cultural representation. It looks at the ways in which these new forms challenge embedded notions of authenticity art, and notions of indigenous culture as necessarily about the past. Alia, V. 2009. Outlaws and citizens: indigenous people and the 'New Media Nation. In International Journal of Media and Cultural Politics 5, 39–54. Anand, V. K. 1980. Conflict in Nagaland. A Study of Insurgency and Counter-insurgency. Delhi: Chanakya Publications. Ao, M. A. 1992. The Art of the Nagas. In: The Nagas. Somare, G., and Vigorelli, L (eds). Italy: Gallerial Lorenzelli. Ao, T. 2006. Identity and Globalization: A Naga Perspective: Globalization and Tribes of Northeast India. In: Folklife. [online]. No 22. Baral, K.C., (ed) National Folklore Support Centre (available on-line: http://www.wiki.indianfolklore.org/images/2/2a/Ifl_22.pdf, accessed 21 May 2011). Ashcroft, B. 2001. On post-colonial futures: transformations of colonial culture. London: Continuum. Balwally, D. 2003. Growth of totalitarianism in Arunachal Pradesh, Mizoram and Nagaland. Guwahati: Spectrum Publications. Barclay, B. 1990. Our Own Image. New Zealand: Pearson Education. Basu, M. 2014. Exam-oriented learning hurts students’ abilities. In The Indian Express (available on-line: http://indianexpress.com/article/cities/mumbai/exam-oriented-learning-hurts-students-abilities, accessed 2 January 2017). Bhuria 1985. Tribal education in India. In Cultural Survival Quarterly (available on-line: https://www.culturalsurvival.org/publications/cultural-survival-quarterly/tribal-education-india, accessed 18 December 2016). Cartmell, D. & I. Whelehan. 2010. Screen Adaptation: Impure Cinema. Basingstoke: Palgrave Macmillan. Census 2011. Nagaland Population Census. (available on-line: http://www.census2011.co.in/census/state/nagaland.html, accessed 28 December 2016). Chasie, C. 1999. The Naga imbroglio: a personal perspective. Kohima: City Press. Conklin, B. A. 1997. Body paint, feathers and VCRs: aesthetics and authenticity in Amazonian activism. In American Ethnologist 24, 711-737. Das, B., 2014. India's northeast speaks out against racism. In Al Jazeera (available on-line: http://www.aljazeera.com/indepth/features/2014/02/voices-from-india-northeast-201421811314600858.html, accessed 1 May 2017). Das, T. C. 1963. Aspects of tribal culture under modern impact in Eastern India. In Anthropology on the March: Recent studies of Indian Beliefs, Attitudes and Social Institutions (ed) B. Ratnam. Madras: The Book Centre. Douglas, T. 2015. Tales of the Tribes: Animation as a Tool for Indigenous Representation (PhD thesis Bournemouth University). Dudley, A. 1984. Concepts in Film Theory. Oxford UK: Oxford University Press. Elwin, V. (1961) 1997. Nagaland. Guwahati: Spectrum Publications. Elwin, V. (1964) 1998. The Tribal World of Verrier Elwin: An Autobiography. India: Oxford University Press. Elwin, V. 1969. The Nagas in the Nineteenth Century. India: Oxford University. Fanon, F. (1961) 2007. The Wretched of the Earth USA: Grove/Atlantic. Glancey, J. 2011. Nagaland: A Journey to India's Forgotten Frontier. UK: Faber and Faber. Goswami, R. 2010. Socio-economic realities in Nagaland: the case of Khonoma. In The Peripheral Centre (ed) P. Gill. New Delhi: Zubaan. Graburn, N. 1996. Ethnic and Tourist Arts, Cultural Expressions from the Fourth World. Berkeley: University of California Press. Gurye, G. S. 1943. The Aboriginals so-called and their Future. Poona: Gokhale Institute of Politics. Haimendorf, von Furer C.  2004. The Naked Nagas. Guwahati: Spectrum Publications. Haimendorf, von Furer C. 1976. Return to the Naked Nagas (An Anthropologist’s view of Nagaland 1936-1970, Delhi: Vikas Publishing House. Handique, M. 2015. Nagaland: Post Accord, a Revolt Rises East of the Sun. In: The Qaint (available on-line: https://www.thequint.com/opinion/2015/09/21/nagaland-post-accord-a-revolt-rises-east-of-the-sun, accessed 30 December 2016). Hearne, J. 2008. Indigenous Animation: Educational Programming, Narrative interventions and Children’s Cultures. In Indigenous Media: Cultures, Poetics, and Politics (eds) P. Wilson, and M. Stewart. London: Duke University. Hutton, J. H. (1921a) 2003. The Angami Nagas. Nagaland: Directorate of Art and Culture. Iralu, E. 2009. Naga Folktales Retold. Norway: Barkweaver. Iralu, K. 2000. Nagaland and India: The Blood and the Tears. Nagaland: Privately published. Kikon, D. 2005. Engaging Naga nationalism: can democracy function in militarised societies? In Economic and Political Weekly 40, 2833-2837. Lhousa, Z. 2016. Nagaland for the Nagas. Nagaland: Private publication. Longkumer, A. 2014. ‘As our ancestors once lived: representation, performance and constructing a national culture amongst the Nagas of India’, Himalaya 35(1): 51-64. McDuie-Ra, 2015. ‘Is India racist?’: murder, migration and Mary Kom. 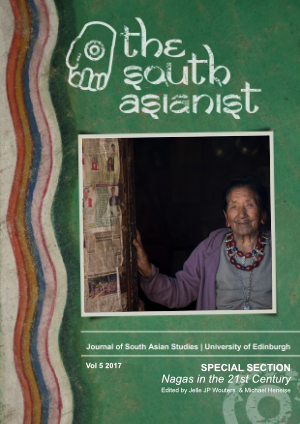 Journal of South Asian Studies Vol 38, 304-319. McFarlane B. 1996. Novel to Film: An Introduction to the Theory of Adaptation. Oxford: Clarendon Press. Mar, I, 2011. God-Land-People, An Ethnic Naga Identity. Nagaland: Heritage Publishing House. Markusen, A. Rendon M. and Martinez, A., 2008. Native American Artists, Gatekeepers and Markets: A Reflection on Regional Trajectories [online] USA: University of Minnesota (available on-line: http://www.hhh.umn.edu/projects/prie/pdf/275NativeAmRegionalTrajectories.pdf, accessed 3 November 2013). Mao., X. P. 2009. The Origin of Tiger, Spirit and Humankind: A Mao Naga Myth. In: Indian Folklife, (33). North East Hill University. Miley, L. 2006.White Writing Black, Issues of Authorship and Authenticity in Non-Indigenous Representations of Australian Aboriginal Fictional Characters. Thesis (MA), Australia, Queensland University of Technology. Morung Express 2016. ‘ENNG’ formed for Governance of Myanmar Eastern Nagaland (available on-line: http://morungexpress.com/enng-formed-for-governance-of-myanmar-eastern-nagaland, accessed 30 December 2016). Mukherjee, A. 2012. Our education system is only focused on exams. knowledge is not a priority. In Outlook (available on-line: http://www.outlookindia.com/magazine/story/our-education-system-is-only-focused-on-exams-knowledge-is-not-a-priority/281312, accessed 2 December 2017). Murtagh, F., A. Ganz, & S. McKie. 2008. The structure of narrative: the case of film scripts. (available on-line: https://arxiv.org/pdf/0805.3799v1.pdf, accessed 1 January 2017). http://www.easternmirrornagaland.com/nagaland-media-need-reinvent-colonial-dross [Accessed 16 December 2016). Odyuo I. 2013. The various aspects of Naga art. In Journal of Humanities and Social Science 9(4) (available on-line: http://www.iosrjournals.org/iosr-jhss/papers/Vol9-issue4/C0941322.pdf, accessed 18 December 2016). Propp, V. (1928) 2009. Morphology of the Folktale. Austin: University of Texas. Sashinungla, 2013. Nagaland Insurgency and Factional Intransigence (Available on-line: http://www.satp.org/satporgtp/publication/faultlines/volume16/Article%204.pdf, accessed 30 December 2016). Säid, E. 1978. Orientalism. New York: Pantheon Books. Sanders, J. 2006. Adaptation and Appropriation. London: Routledge. Singh, P. 1977. Nagaland. In Naga Culture. New Delhi: National Book Trust. Singh Y. 2000. Globalization and Local Cultures Issues and Perspectives in India. New Delhi: Rawat. Smith, L. T. 1999. Decolonizing Methodologies, Research and Indigenous Peoples. London: Zed Books. Spivak, G. C. 1988. Can the subaltern speak? In Marxism and the Interpretation of Culture (eds) C. Nelson & L. Grossberg. Urbana: University of Illinois. Sutter, R. 2008. Shadows and tigers: concepts of soul and tiger-Men. In Naga identities: changing local cultures in the Northeast of India (eds) M. Oppitz, T. Kaiser, A. Von Stockhausen & M. Wettstein. Ghent: Snoeck. Shyamacharan D. 1993. Dialogue on tribal and folk culture. In Dialogue on tribal and folk culture: articles from Parishad’s publication 'Chaumasa' (ed) Pratyaya. Madhya Pradesh: Adivasi Lok Kala Parishad. Tariq, S. 2011. Problem in Northeast India: a case study of Nagaland. Journal of the Institute of Regional Studies 29, 78-97 (available on-line: http://www.irs.org.pk/indiapakistan/spjan11.pdf0, accessed 30 December 2016). Telo, A. R. 2013. Participatory film production as media practice. International Journal of Communication 7, 2312-2332. Veerbhadranaika, P., R. S. Kumaran, S. Tukdeo & A. R. Vasavi. 2012. 'The Education Question’ from the Perspective of Adivasis: Conditions, Policies and Structure. Bangalore: National Institute of Advanced Studies. Wells, P. 2013. Thou art translated: analysing animated adaptations. In Adaptations: From Text to Screen, Screen to Text (eds) D. Cartmell & I. Whelehan. New York: Routledge. Wettstein, M. & A. von Stockhausen. 2012. Connecting to the Past. In Hill Peoples of Northeast India. The Nagas: Society, Culture and the Colonial Encounter (eds) J. Jacobs, A. Macfarlane, S. Harrison and A. Herle. London: Thames and Hudson. http://d2buyft38glmwk.cloudfront.net/media/cms_page_media/11/FITC_Adaptation_1.pdf, accessed 9 June 2014). Wontong, T. 1992. Outline of a culture in transformation. In The Nagas (eds) G. Somare & L. Vigorelli. Rome: Gallerial Lorenzelli. Wouters, J.J.P. & T. B. Subba. 2013. The 'Indian Face' India's Northeast and 'The Idea of India'. In Asian Anthropology 12, 126-140 (available on-line: http://www.tandfonline.com/doi/abs/10.1080/1683478X.2013.849484, accessed 2 May 2017). Wright, S. 1998. The Politicization of 'Culture'. In: Anthropology Today. 14 (1), 7-15. Zhimomi, K. K. 2004. Politics and militancy in Nagaland. New Delhi: Deep and Deep Publishers.